Sure, Led Zeppelin IV and Physical Grafitti are generally accepted as Led Zeppelin’s twin peaks, though you could find someone to make a case for each of their albums (even In Through The Out Door). But it’s the 1970 bootleg Led Zeppelin Live On Blueberry Hill that is the true connoisseur’s choice when it comes to Zep albums. Bootlegs and Zeppelin have been synonymous for over decades. Despite manager Peter Grant’s heavy-handedness when dealing with anyone he caught taping their shows, Zep became the most bootlegged act of all time. 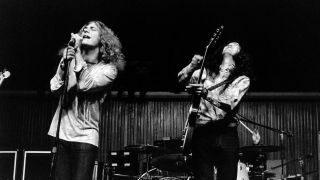 On the night of September 4, 1970, during their sixth American tour, two separate teams of fans were intent on taping the Zeppelin gig at the Inglewood Forum in Los Angeles. Both parties came away with lengthy representations of the band’s then current state of play, recorded on reel-to-reel machines close to the stage. Regardless of which version you hear, the sheer authenticity of the performance shines through. The dynamic thrust of Bonham’s drums, the sinewy grind of Page’s guitar, Jonesy’s resonant bass lines and melodic keyboards, plus the outstanding clarity of Plant’s vocal shrieks (enhanced by the echo unit used at the time), all merge into a ferocious mix that magically recreates the electricity of the occasion. The recording that would become known as the album Led Zeppelin Live On Blueberry Hill was captured by a pair of West Coast bootleggers whose previous credits included Dylan’s Great White Wonder set and the Stones’ Live’r Than You’ll Ever Be. Another bootlegger known as Rubber Dubber also recorded the show and quickly issued it as a double album stamped Led Zeppelin Live Los Angeles Forum 9-4-70. The more common Live On Blueberry Hill Blimp label version with a distinctive surreal cover insert, also came out within weeks of the show. Whatever Happened To The Stars Of The Decline Of Western Civilization Pt 2? Moments to relish include the unpredictable Communication Breakdown medley that included Buffalo Springfield’s For What It’s Worth and The Beatles’ I Saw Her Standing There, plus the Zep I opener Good Times Bad Times. Not forgetting freshly minted nuggets from the soon to be released Zep III album such as Since I’ve Been Loving You and the rarely played live Out On The Tiles. A lengthy Whole Lotta Love turned into a rock’n’roll juke box as they randomly threw in covers of Buddy Holly’s Think It Over and Leiber, Stoller & Barrett’s Some Other Guy – a formula they repeated with a breathless encore rendition of Fats Domino’s Blueberry Hill. Back in their heyday, bootleg recordings of Led Zeppelin offered a whole new perspective on the band. This remains as essential a part of their discography as any of their official albums. To paraphrase the great Fats himself, Led Zeppelin Live On Blueberry Hill is still an absolute thrill.